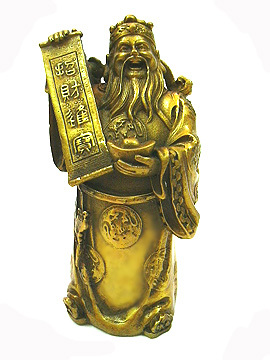 The bronze Rich Wealth God is depicted carrying a gold ingot with a scroll that depicts fortunate characters. This Rich Wealth God is wearing a robe with chinese fortune symbol. He is smiling to ensure invitation of money into your homes and business premises. This item will definitely be important for those seeking to multiply they wealth. This item will be admired by visitors and peers and is a collector's item for Feng Shui enthusiast and bronze lovers. The Rich Wealth God has the special duty to help people become rich, and also in gaining windfall luck and gambling luck. He brings quick prosperity (a lot of gains from money perspective) and good fortune to the household and those who are in business or gambling. The Rich Wealth God is extremely popular among the chinese community and his figure or painting must be displayed during the chinese lunar new year to ensure a smooth ride for the upcoming year ahead.